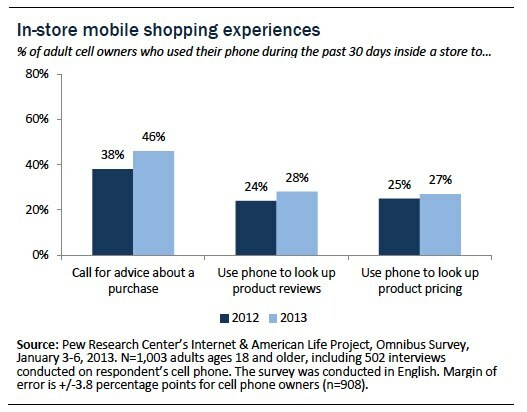 46% of cell owners used their phone while inside a store to call a friend or family member for advice about a purchase they were considering. 28% of cell owners used their phone while inside a store to look up reviews of a product to help decide if they should purchase it or not. 27% of cell owners used their phone while inside a store to look up the price of a product, to see if they could get a better price elsewhere. Taken together, 58% of cell owners used their phone for at least one of these reasons, with young adults and smartphone owners leading the way — 78% of cell owners ages 18-29 and 72% of smartphone owners did at least one of these with their phones this holiday season. The 46% of cell owners who called someone for advice about a purchase represents a significant increase from the 38% of cell owners who did so during last year’s holiday shopping season. When asked what happened on the most recent occasion they looked up the price of a product inside a store using their cell phone, 46% of “mobile price matchers” say that they ultimately purchased the product in that store — an 11-point increase from the 35% of such price matchers who said this in 2012. Some 12% wound up purchasing the product online, a figure that is not significantly different from the 19% who did so in our 2012 survey. These findings come from a survey of 1,003 adults ages 18+ between January 3-6, 2013. The interviews were conducted in English on cell phones and landline phones and the margin of error is plus or minus 3.8 percentage points for the 908 respondents who are cell phone owners and who received most of the questions that are reported here.